The Economic and Financial Crimes Commission (EFCC) says it has arrested one of its drivers, Nasiru Isa, for allegedly burgling a sealed house owned by Alex Badeh, former chief of defence staff. In January 2016, the EFCC sealed off some pieces of property in Abuja owned by the former defence chief, who is facing trial for allegedly diverting funds meant for the military. In a statement issued on Thursday, Wilson Uwujaren, EFCC spokesman, said Isa was part of a robbery syndicate which specialised in breaking into property sealed off by the anti-graft agency. of the gang are Abubakar Jibrin, Abdulsalam Ado, Ibrahim Babangida, Reuben Dauda, Hassan Aliyu, Sani Yusuf and Murtala Mohammed. 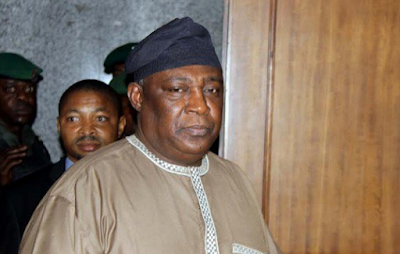 Uwujaren said the suspects were caught in the act of breaking into Badeh’s property. “On August 30, 2016, operatives of the EFCC, as part of monitoring activities on the sealed property, had gone to the site to execute a search,” he said. “However, members of the syndicate took to their heels on sighting the operatives of the anti-graft agency. A carpenter, Yakubu Muhammad, who was hired by the syndicate, was left behind and was subsequently arrested by the operatives. The EFCC spokesman said investigations showed that some people moved about 12 bags believed to contain items linked to money laundering into the property after it was sealed off. “Investigations revealed that one of those in the know about the goods was the brains behind the scheming to steal them. The syndicate decided they would need to subdue the security man at the property, which would mean they would need to involve security personnel in the syndicate,” he said. “Subsequently, Isa was contacted. To further beef up the security aspect of the crime, he also contacted his friend, Ismaila, who came for the ‘operation’ fully armed. In perpetrating the crime, Dauda had posed to be a senior official of the EFCC, while Jibrin posed as an Intelligence police officer in the inspector-general’s office. A similar incident had happened in one of the Abuja residences of former President Goodluck Jonathan. In July, policemen guarding the property burgled it, stripping it bare.